Both Quinn Benjafield and the Green Lantern were seen at Rogers Place on Saturday night, but only one turned in a heroic performance. 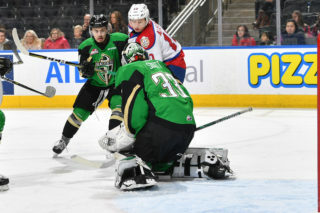 Benjafield scored twice in the first period – once shorthanded and once on the power play – to help guide the Edmonton Oil Kings (8-7-0-1) to a 5-2 win over the Saskatoon Blades (8-5-2-0) in front of 7,219 fans during Superhero Night. Benjafield’s stats have sailed up, up and away in the last three games, as the North Vancouver, BC native has tallied three goals and six points during that span. Trey Fix-Wolansky also gave a valiant effort, notching his fifth three-point performance in 16 games played this season (1G, 2A). 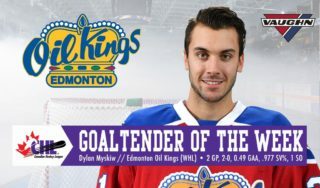 Dylan Myskiw (6-5-0-0) started in goal for the second time in as many nights and again earned the win; the third straight for both Myskiw and the surging Oil Kings. Myskiw needed just 23 saves for the win, while Dorrin Luding (1-1-1-0) took the loss after surrendering four goals on 44 shots. With the Blades on the power play, it was the Oil Kings who opened the game’s scoring as the first period was winding down. Benjafield gave Edmonton a 1-0 lead, shorthanded, from Fix-Wolansky with just 1:27 remaining in the opening frame to round out scoring in the first 20 minutes. Shots in the first heavily favoured the Oil Kings, 22-9. 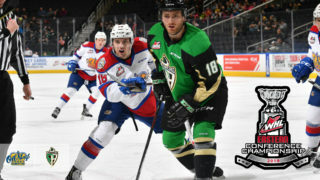 In the second period it was more Oil Kings, as Benjafield made it 2-0 Edmonton with his second of the night – this time on the power play – from Fix-Wolansky and Brett Kemp at 5:16. For the second straight night a member of the Oil Kings potted a highlight reel goal; last night Benjafield, and tonight Vladimir Alistrov. Near the top of the circle in the offensive zone, Alistrov dangled the puck through the legs of a Blades defender, then outlasted Luding with some nifty stick work in the slot before burying the puck into the wide open cage. Andrei Pavlenko and Matthew Robertson picked up the assists on the 3-0 goal, which came at 15:06. But with the Oil Kings on their third man advantage of the night it was Saskatoon who capitalized before the period was out, as newcomer Gary Haden scored his first as a member of the Blades to cut the Edmonton lead to 3-1, shorthanded and unassisted, closing out period scoring at 17:42. 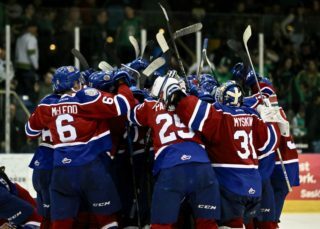 Shots on goal in the second period were 10-6, Edmonton for a two-period total of 32-15, Oil Kings. Kemp picked up his second point of the night with his eighth goal of the season just past the midway point of the third period to extend the Oil Kings lead to 4-1, from Robertson, at 11:34. In the dying moments the Blades cut the lead to 4-2, as Haden notched his second of the game, from Chase Wouters and Jackson Caller, at 18:35. 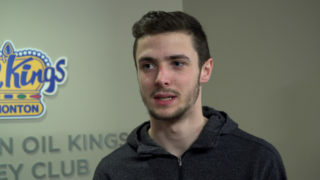 But Fix-Wolansky answered right back just 31 seconds later, picking up his third point of the night and 10th goal of the season, from Ethan Cap, at 19:06 to solidify the 5-2 win. Saskatoon finished the night going 0-for-3 on the power play, while Edmonton was 1-for-4 with the man advantage. 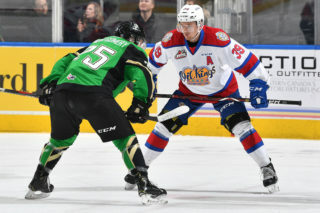 Saturday also marked the first career regular season game for 15-year-old defenceman Keagan Slaney, the Oil Kings’ first round, 20th overall selection in the 2018 WHL Bantam Draft. Vladimir Alistrov (EDM) (3), Matthew Robertson (EDM) (2), and Quinn Benjafield (EDM) (1) were selected as the Three Stars of the Game. The Oil Kings wrap up their three-in-three weekend tomorrow, Sunday, October 28 when they host the Lethbridge Hurricanes at Rogers Place at 4:00 PM MT for Hockey Halloween.